The village of Reykjahlíð has approximately 300 inhabitants and is situated on the shores of Lake Mývatn in the north of Iceland. It is the seat of the municipality of Skútustaðahreppur. During the so-called Mývatn fires, caused by the eruption of the nearby volcano Krafla in 1729, the village was destroyed by a lava stream. However, the inhabitants were saved when the lava flow stopped in front of the village church on higher ground, allegedly as the result of the prayers of the village priest. The church is still there, although the present building dates from 1972. A local airport provides sightseeing during the summer. A plant for extraction and processing of diatomite was a main point in local economy until 2004 when it was shut down. Mývatn Nature Baths opened on 30 June 2004. ^ "Reykjahlíð 1961-1990 Averages". Icelandic Meteorological Office. Retrieved 29 May 2016. 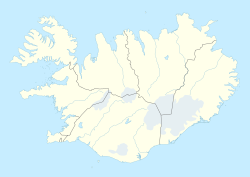 Wikimedia Commons has media related to Reykjahlíð. This page was last edited on 5 January 2018, at 03:52 (UTC).